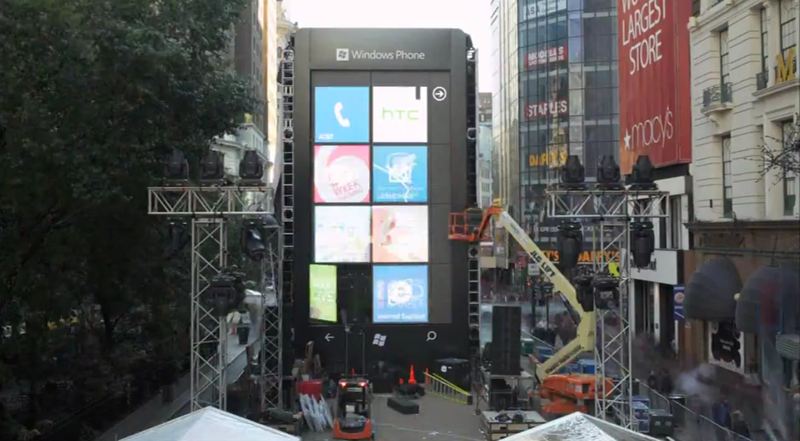 To compliment its Windows Phone handset launch today, Microsoft build a giant 6-story Windows Phone in New York’s Herald Square, demonstrating what US consumers could expect to see from the latest smartphones being launched at Monday’s event. With four handsets expected to be showcased at the launch, including the HTC Titan, Samsung Focus S, Samsung Focus Flash and HTC Radar 4G, Microsoft is using the event and its massive Windows Phone structure to promote the latest US Windows Phone smartphones ahead of the holiday season. This morning, Microsoft posted a video to its YouTube account to show how the 6-story Windows Phone was built, notifying viers that the “phone was built to celebrate the arrival of 4 new Windows Phones in the US for Holiday 2011”. It’s an impressive feat, one that will be almost impossible to miss if you are in the area. Microsoft is holding a media event this afternoon and is expected to announce the launch of a number of value-added services and third-party applications. We will of course keep you updated on today’s developments from Herald Square in New York City.